Just on the eve of WWII, the USAAC was seeking a new primary trainer. It wanted a monoplane instead of the usual biplanes of the time. The requirements were for an aircraft that was easy to fly, easy to maintain and relatively inexpensive to produce. 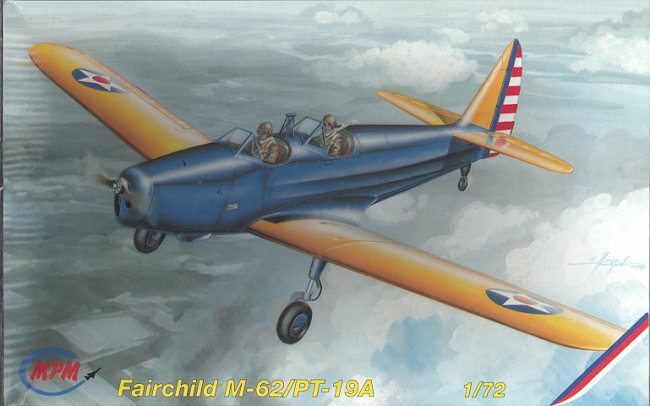 Fortunately, Fairchild had designed a training aircraft for civil schools and so entered its Model 62 trainer into competition. This aircraft had a newly designed wing that was supposed to nearly eliminate stalls and spins, just what was needed for those just learning to fly. A contract was awarded in 1939 so production got underway on the type both in the US and Canada under the designation PT-19. By 1944, more pilots had gotten their initial flight training in the PT-19 than any other aircraft. Even today, the PT-19 is flown by warbird enthusiasts. MPM has been steadily improving their short run kits over the years. This one is of relatively recent design and is quite well made. It still has short run characteristics of no alignment pins, some flash on most parts and relatively thick parts attachment points. It also still has vacuformed canopies and only one set of them. Also included is a small photoetched fret. The PT-19 has a fabric covered fuselage and control surfaces. The detailing on those parts is rather well done and does not have the sag that is so prevalent with a number of older kits. The cockpit is open on this kit so it would benefit from some detailing. 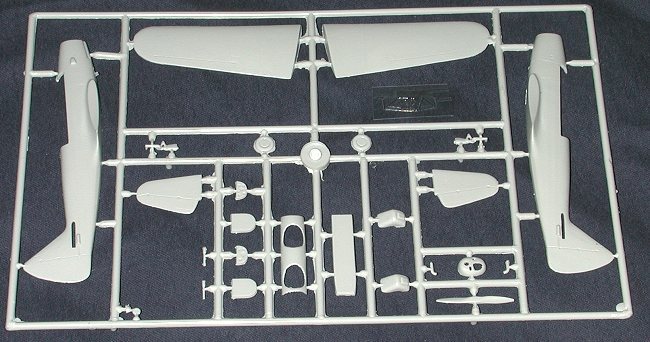 MPM has the basic parts in plastic with other bits like seat belts and rudder pedals in photo etch. While the basic framework is on the inside of the fuselage, there is still room for the more dedicated modeler to put in other details like throttles and other smaller controls. The instructions are well done and more than adequate. Color callouts are given in Humbrol numbers. Included in the instructions is a side cutaway from an old Air Progress magazine to help with any additional detailing. 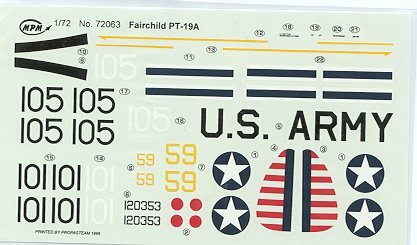 The decal sheet includes four aircraft. Well, two really as the others are just a number change. Both have blue fuselages with yellow wings and tail surfaces, typical for early war trainers. The two US markings are for aircraft with the red dot in the roundel and one without the red dot. The other two aircraft are for those of the Norwegian AF in Canada. These are the same colors with just number changes. You'll have to paint the red as the white outlined blue stripe is all that is on the decal sheet. I'd recommend adding another white stripe from your spares box to underline the kit one as I'm sure the red will bleed through the kit decal. Overall, it looks like a pretty simple kit and one that is pretty colorful as well.